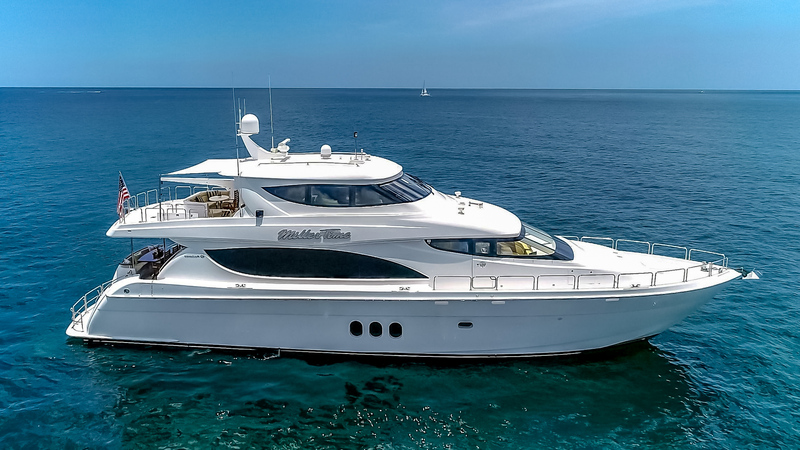 Bob Cury is delighted to announce his newest central listing - the 2012 80' Hatteras Motoryacht, MILLER TIME. Representing the most highly customized 80' Hatteras Enclosed Bridge on the market, MILLER TIME features extensive options and upgrades. A result of countless hours of custom engineering, MILLER TIME is the absolute finest 80' Hatteras ever built, owing to her knowledgeable, hands-on owner and captain assuring just that during the build process. Featuring the enclosed bridge option, zero speed stabilizers, hydraulic bow and stern thrusters, Sea Recovery watermaker, hydraulic anchor windlass, (2) stern docking windlasses, (4) helm stations, back up seawater and fuel transfer pumps and underwater lights. Her custom interior features a high gloss African mahogany joinery package complimented by oak flooring, granite countertops, back splashes and center island in the galley. Upgraded appliances along with complete electronics and A/V packages further add to the vessel's thorough equipment list and flawless condition. Powered by Caterpillar C-32A's with only 550 original hours. This yacht is a 'perfect 10', in better than new, turn-key condition, and her asking price has just been reduced to $ 4,395,000! Be sure to see MILLER TIME in the RJC Yacht Display at the 2019 Miami Yacht Show, February 14 - 18! For Full Listing Specifications, Photography, and Video please click below!